The tobacco hornworm is a voracious eater that can do a great deal of damage in a flower or vegetable garden. I decided to prune the dead flowers from my Buddleia (Butterfly Bush) the other day. It is attracting butterflies like crazy, but most of the flowers were long dead. I thought pruning it would give it a chance to form new flowers before fall and attract even more butterflies. As I started pruning I noticed that many of the stems were completely clean of leaves. I didn’t think much about it at first but just pruned behind the bar stems and moved on. But, lo and behold, it did not take me long to discover just WHY my stems were so bare. The bush was playing host to a huge Tobacco hornworm caterpillar. He was just as happy as anything in his all you can eat buffet. You cannot tell from the photo, but this caterpillar was at least 4 inches long and the diameter of a good sized man’s middle finger. The Tobacco hornworm is closely related to another large caterpillar: The Tomato hornworm. Both are often kept as pets by children because of their sizes. This variety of hornworm is distinguished by seven diagonal stripes on its sides. Tomato hornworms have eight of the lines in V shaped markings. 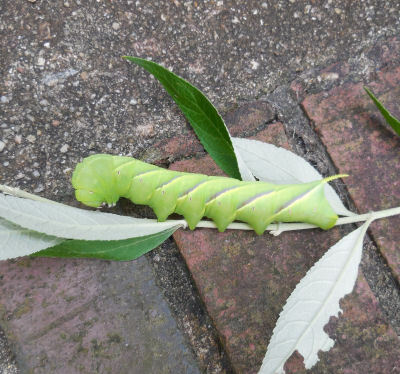 The tobacco hornworm is quite commonly seen in the southern United States, especially the Gulf Coast States. Its range extends northward as far as New York. The caterpillars can measure 45-60 mm in length and the adult moths, as expected can have a wing span of about 100 mm. How or what can be done to avoid/deter/kill them? Very nice pictures, thx for sharing. The latter one is a rather rare migrating species, Manduca rustica, not a synanthropic one, and not eating any of the crops; You found it on a Buddleia.